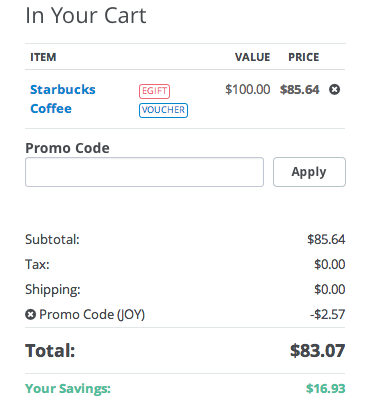 Raise.com is offering Starbucks Gift Cards at steep discounts!. They come in $100 denominations and are over 14% off. Start your shopping from Top Cashback and you'll get an additional 2% cashback into your account for a total of 19% off. I have been use Top cashback since November of 2012 and I already have close to $300 in my account for shopping I would be doing anyway. 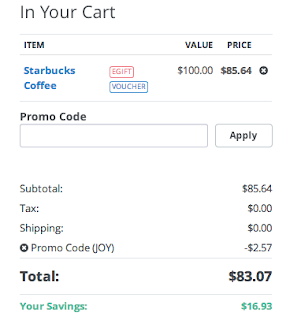 Pay with your Discover Card and you will get 5% cashback on any online purchases until the end of December (limit of $75 cashback for the quarter). This would be a total of 24% off! If you use a regular 1% cashback card you will still be getting 20% off! If you are a new customer you can use coupon code RAISE60AF and save $5 off $60. I don't know if they can be combined because I am not a new customer but give it a shot.